Happy Mother’s Day to Grandma’s Predictions! 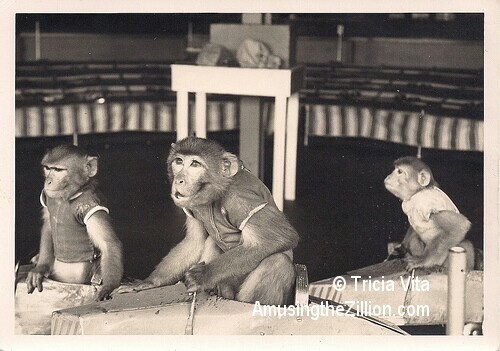 Happy Mother’s Day to Coney Island’s Grandma’s Predictions! The rare circa 1923 fortune teller returned to her home under the 1920 Wonder Wheel on Mother’s Day 2013 after several months in arcade restorer Bob Yorburg’s workshop. Her inner workings had been destroyed by floodwater from Sandy. Grandma got eye surgery as well as a new wig, dress and wax hands cast from the original mold, and a fine new cabinet. Visit Grandma and get your prediction — only 50 cents. The venerable, circa 1923 “Grandma’s Predictions” has been telling fortunes under Coney Island’s 1920 Wonder Wheel all her life. A couple of seasons ago a brand-new Zoltar was brought in to keep her company and proved very popular with visitors to the arcade. Hurricane Sandy soaked both of them, and decapitated poor Zoltar. A new Zoltar Speaks machine was promptly ordered and is already here, but Grandma, an irreplaceable antique as well as a good luck charm for the three generations of the Vourderis family who have owned the park, was sent off to be restored. Last night these riveting videos of Grandma’s wax head getting “eye surgery” at National Jukebox Exchange appeared on YouTube. The octogenarian tarot card reader is also getting new wax hands cast from the original mold, according to arcade restorer John Papa. He appears in the video along with fellow arcade restorer Bob Yorburg, who told ATZ that Grandma will get a new wig, dress and cabinet, too. 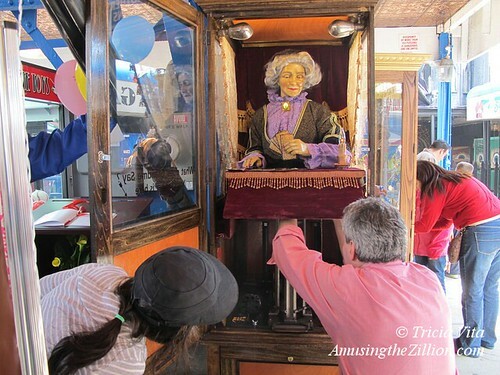 The rare arcade piece is known as the “Cleveland Grandma” by collectors since she was built by the William Gent Manufacturing Company in Cleveland, “Grandma’s Predictions” is expected to come home to Coney Island on Mother’s Day, where a welcome home party will be held at Deno’s Wonder Wheel. Legend has it that circus contortionist Leon LeRoche took his inspiration for “La Boule Mysterieuse” from a popular gambling game that set up outside the show’s tent in Romania. 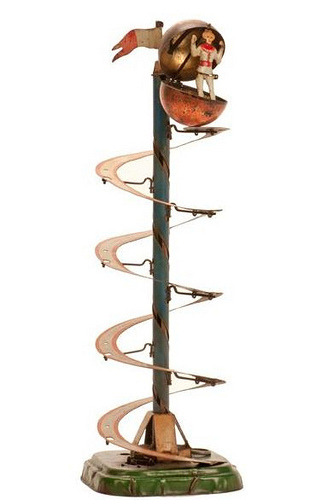 After gamblers placed bets on one of several numbers, the showman let a ball roll from the top of a foot-high spiral, shouting as the ball made its way to the winning number. 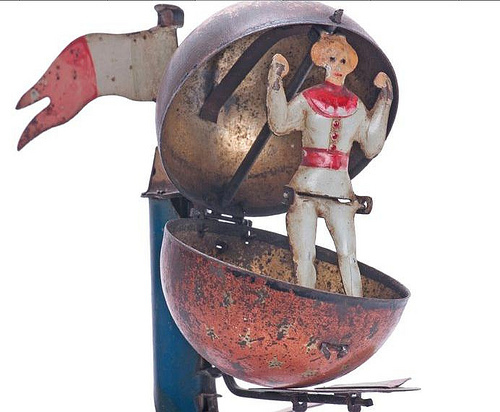 LaRoche’s legendary act, which was celebrated by this 1906 tin litho toy, had him scaling a 12-foot high spiral while inside a metal ball that rolled slowly and mysteriously upwards. “If it had not been evident that the idea of the trick had come to him from seeing the spiral of the Turkish showman, one would positively have believed the whole thing to be a miracle,” according to LaRoche’s story in the 1928 book Star Turns. The trick was regarded as “an unfathomable mystery, a sudden stroke of genius. 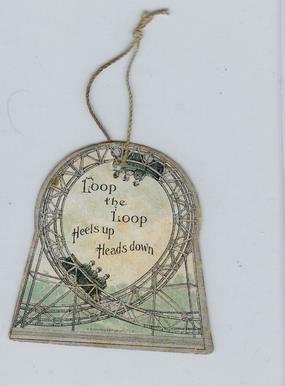 Everywhere the agents arranged performances of the Man of Wonder with his troupe.” LaRoche doubled the height of the spiral to 24 feet and by the time he began touring with Barnum and Bailey in 1896, the track was 30 feet tall. 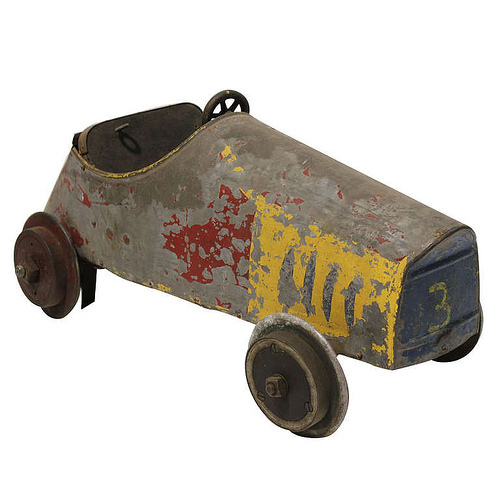 “Pull the string on the toy and it duplicates his feat,” says the catalogue description for the antique toy, which was made in Paris by Fernand Martin. On February 2nd “La Boule Mysterieuse” will be on the auction block at Potter & Potter in Chicago. The pre-sale estimate is $800-$1,000 and the online sale already has bids. A plethora of vintage arcade games, slot machines and gambling paraphernalia will be on the auction block next weekend at Victorian Casino Antiques in Las Vegas. 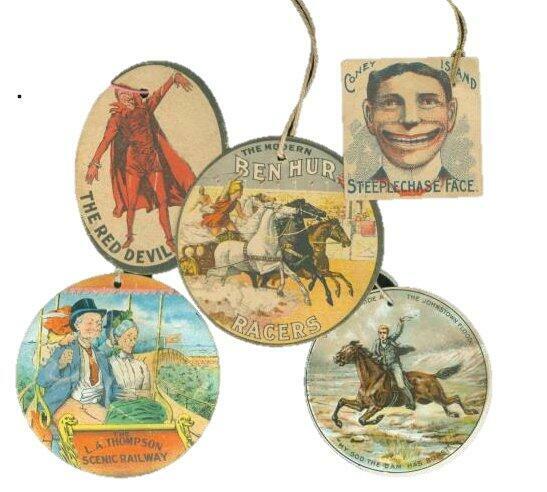 Online bidding is also available for the January 19-20 sale. Here are a trio of items that caught our fancy. 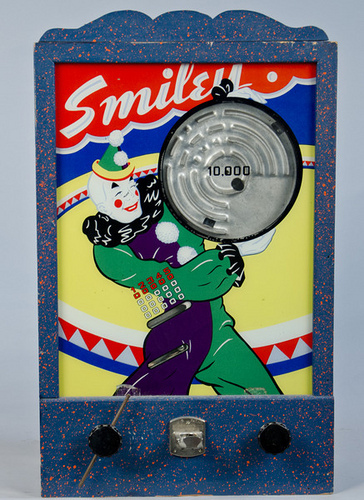 “Smiley” the Clown, the first post-World War II arcade game from Chicago’s Pioneer Coin Machine Company, has strong graphic appeal. In addition, it takes a lot of skill to win. Introduced in 1946, the game requires players to maneuver the ball through a circular maze. “Be a Champion. 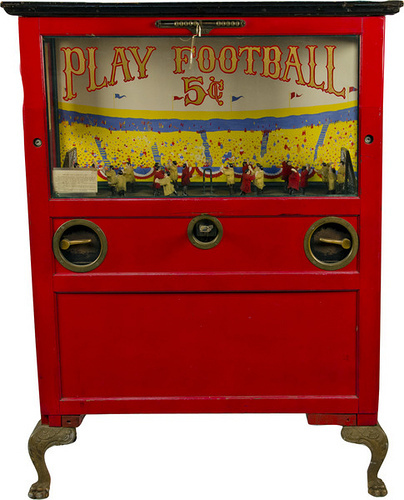 Learn ‘the Kicks’ in Football!” The Chester-Pollard Amusement Company’s 1924 “Play Football” was a popular and fun nickel arcade game for two players. The idea was to score a goal for your team by pushing the handle to make one of the little soccer players kick the steel ball. Among the gambling equipment in the sale is this H.C. Evans Horse Race Wheel complete with odds changer. Chicago’s H.C. Evans and Company was the country’s leading manufacturer of carnival and casino equipment for six decades. 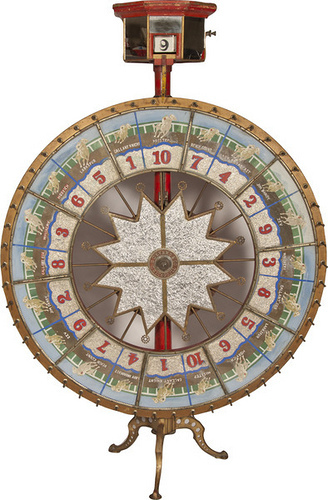 Its top of the line wheels include the Big Six, the Jumbo Dice Wheel and the Horse Race Wheel. The wheel measures 60 inches in diameter and approximately 87 inches high. Step right up and see “Double Trouble,” an early 20th century peep show reel. 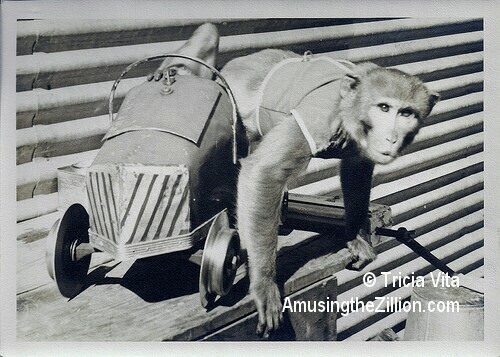 Yes, it’s SFW though dancers wearing short skirts were considered risque when this moving picture machine was new. 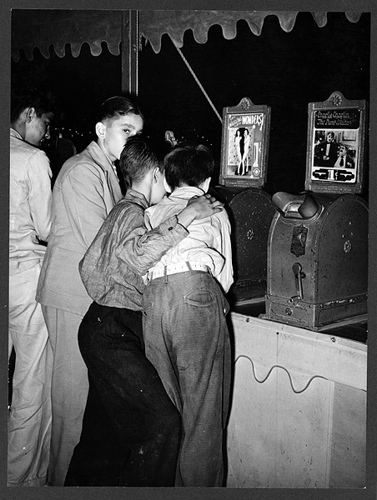 Invented in 1894 and marketed by the American Mutoscope Company, the coin-op machines contained flip book movies with a viewing time of about a minute. These classic reels were made from 1897 to 1907, when the company turned completely to projection, and were created and almost totally produced in New York City. Although the 4,000-plus titles included a variety of subjects, it was the girly movies with suggestive titles like “Artists and Models” and “Wiggling Wonders” (glimpsed in the photo below) that won notoriety. What did the girls do with the hat that was so scandalous? They frolicked and kicked it high over their heads while wearing short skirts like the girls in “Double Trouble.” Bring back the peep show! It would be fun to have some of these old Mutoscope movie machine as well as an arcade museum as we noted previously in “ATZ’s Big Wish List for the New Coney Island,” ATZ, October 7, 2012).